We don’t need to tell you that Utah has great skiing. But did you know that you could get a scholarship to a university in Utah and a year-long ski pass to hit the slopes after class? And this is just one example of the extensive financial aid opportunities available to Utah students. Let’s take a look at all the resources available to Utah residents like you (including the ones involving skiing!). If you’re not sure where to begin finding financial aid, look no further than the FAFSA. The FAFSA, also known as the Free Application for Federal Student Aid is how the federal government distributes need-based tuition aid to students. By filling out this form, you may be able to gain substantial funding for college, depending on your financial situation. Through FAFSA, the federal government distributes $150 billion of need-based funding to students every year. Your FAFSA application also puts you in the running for federal loans, as well as some state and institutional financial aid. You might have heard that the FAFSA is lengthy and confusing. Well, we’re sad to report that FAFSA, indeed, can be frustrating. However, we created this step-by-step guide to completing the FAFSA questions to try and make the process as painless as possible. Utah is committed to making college affordable for students. That’s why he Utah System of Higher Education manages the website Step Up Utah, which is the hub for financial aid resources for Utah residents. Here, students can find the scholarships available from the state of Utah. Regents’ Scholarship is a program that encourages students to become academically prepared for college while also earning money college. More information can also be found here. Utah Scholars Program is a point-based system for high school students to get ready for college. Participants have the opportunity to apply for special scholarships. New Century Scholarship gives students who earn an associate’s degree in high school the opportunity to receive a scholarship to use at certain Utah institutions of higher education. While there are a limited number of financial aid opportunities directly from the state of Utah, scholarships such as the Utah Scholars program listed above, are not merit- or need-based, meaning they’re open to all students.. So if you didn’t get all A’s your sophomore year of high school, you can still receive funding. In fact, you can even earn points for the scholars program by following their Instagram, Facebook, and Twitter accounts, or simply visiting a college campus. Further, be sure to stay up to date on the latest information for each scholarship by visiting the Step Up Utah website. If you’re still in high school, your guidance counselor can be a valuable source for local scholarship info from organizations such as the Rotary Club, Kiwanis, or local businesses. Be sure to make regular appointments to find out about new offerings. Guess what? There are even more funding opportunities to be found at the institution level. Let’s look at the financial opportunities provided by the University of Utah, which provides departmental scholarships as well as need-based scholarships to students. Students must apply for the FAFSA to be considered for need-based financial aid. For departmental scholarships, you will need to apply for consideration by filling out a separate form. Make sure you check out the departmental scholarship webpage for more information on how to apply. We cannot stress enough how many scholarships are offered by Utah institutions, particularly the University of Utah. Take for example the College of Engineering’s Scholarship Search. Here, students who are interested in studying engineering can find a huge variety of scholarships, both from the University and third-parties. From the College of Humanities, the Ophelia Flores Laurella Pathfinder Scholarship awards financial support to a first-generation college student with demonstrated financial need. And one of the most unique scholarships is the Skiing for Scholarship Award, which is a $2500 merit-based scholarship for students majoring in humanities that includes a one-year season pass to Brighton Ski Resort, with skiing or snowboarding lessons thrown in as an added bonus. Make sure you check out the financial aid websites of any schools you apply to to ensure you are taking advantage of any and all scholarships! Even with all the financial aid opportunities available to students, it’s common for financial aid to not cover all college expenses. If you find yourself in this position, a private student loan can often be helpful. It is important, however, that you get the best deal for your student loan so you aren’t paying more than you have to. 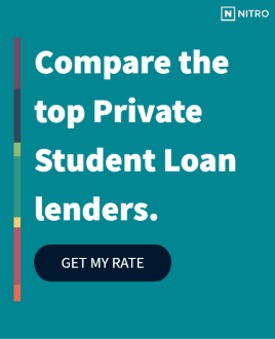 That’s why we’ve found the best banks for private student loans to help you get the best rates available. You can also use our NitroScore tool to calculate what your future finances may look like based on the school you’ll be attending, your major, and the amount of funding you already have from savings, grants/scholarships, and financial aid. With NitroScore, it’s possible to have a comprehensive idea of your college costs. Now that you have these tools to help you pay for college, you can be assured that you are on the right track to paying for your education!